Witness my love/hate relationship with Starbucks. While I resent them for being a huge, faceless corporation that sells, for the most part, terrible-tasting, too sweet, overpriced caffeinated beverages, I still go there. There’s one on every street corner, it seems, and the wifi works well with my computer. And you’ve got to admire their ability to brand themselves. While some Starbucks are starting to sell wine and beer (it will be years before our archaic liquor laws will allow you to have a glass of wine at a Starbucks in Canada), I am loving their mobile app, which they released a couple months ago. You must understand that I download a lot of apps. I play with them, test them, and most of them are novelties that end up stuck in a file on the 7th page of my iPhone. 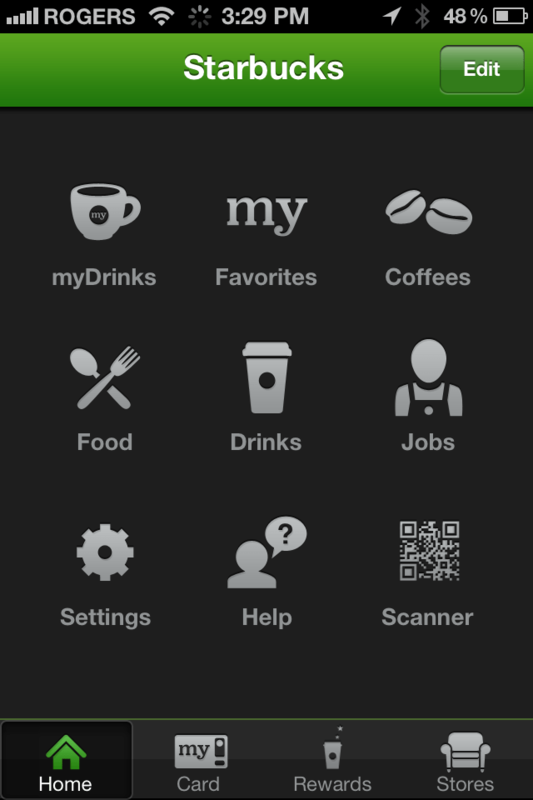 The Starbucks app (iPhone, iPod Touch and Android), however, is brilliantly designed. It has several great features. You can design your own drink, and of course check out what food offerings they have. Last year, I was dating a guy whose drink was a “Tall, in a Grande cup, Americano with three pumps of Toffee Nut Syrup and soy on the bar.” I think. I never could get it right without him writing it down. This new app allows you to remember your favorite drinks and your friends’ favorite drinks. Very convenient when you’re being sent on a 3pm coffee run for the office. It also uses GPS to locate the nearest Starbucks to wherever you are. 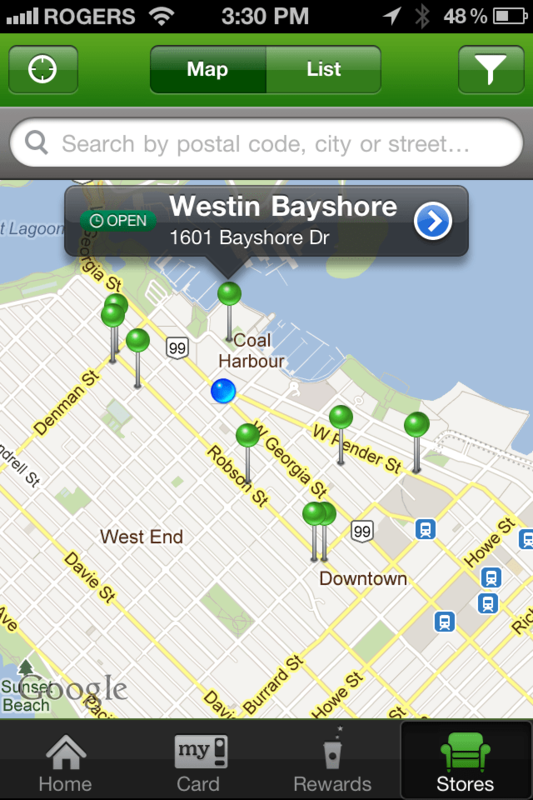 And it tells you if that Starbucks is open or not. But my favorite part of the app is the payment option. We all probably have Starbucks cards lying around. 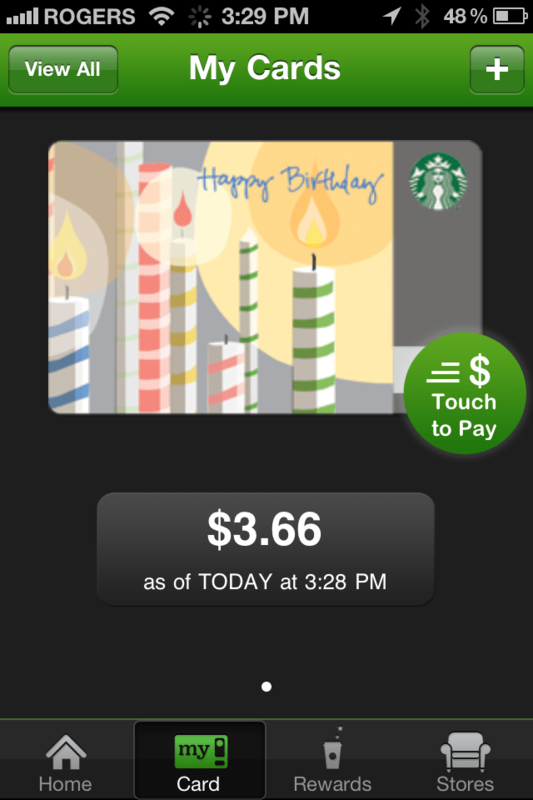 You get them for your birthday, for prizes… If you register your card online at Starbucks.com, you can sign into that account through your phone, and pay for your purchases at Starbucks using your phone. It’s a very cool feature. I have often set off to an early-morning yoga class with just my mat, keys, and phone, and bought myself a coffee to sip on the walk. It’s brilliant. Other app-makers: take note! This one is a winner. I love that you are so enthusiastic about it!! It is a really great app, though, don’t you think? You almost got my order right, Bex – it’s 4 pumps of that scrumptious Starbucks Toffee Nut syrup. But perhaps you have a point; maybe I should cut back on that sweet stuff. Hope you’re doing well, and thanks for the shout out. We should do coffee someday – you can order; but it’ll be on me.